Norris Ferry exists to glorify God by loving Christ, Christians, Neighbors, and Nations. As we do this we will be part of God’s mission of spreading His gospel from neighbors to nations. We are not simply building one church in the Norris Ferry community; rather, we are seeking to establish a church that will raise up and send out an army of gospel missionaries who spread the gospel in their own homes, in their workplaces, in their neighborhoods and beyond - continuing the mission we see in Acts. In one way or another we view every member as a gospel missionary. We do this through congregation, community, and core classes. The entire congregation gathers during our Sunday morning worship services at 9AM and 10:30AM. 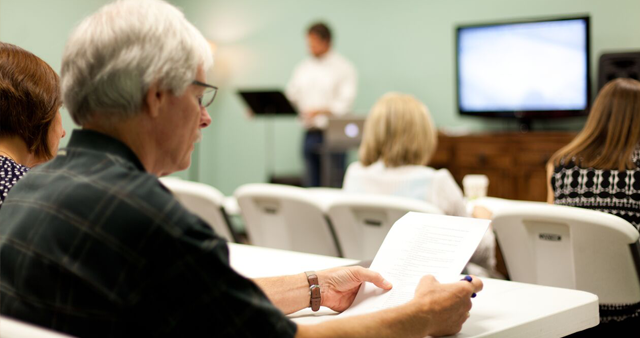 These services are similar to the temple gatherings of the early church where believers gather together to study the Word of God with gifted teachers and to worship God in response to His revelation through His Word. Just as the early church met house to house, our church family breaks into small groups that meet in homes during the week. Community Groups provide the loving and supportive relationships one needs to grow spiritually. Community Groups are the heartbeat of this church. Join us at 9:00am and 10:30am as we walk through the whole Bible in three years! Our Core Classes follow The Gospel Project material. The Gospel Project is an ongoing group Bible study resource that helps participants encounter the gospel of Jesus Christ on every page of Scripture. It is a chronological, Christ-centered Bible study that helps you turn the gospel story into a gospel culture and motivate participants to mission at home and around the world. For further information on The Gospel Project, please visit, https://www.gospelproject.com/adults/. We are excited you are interested in being a part of our next Connection Group. Connection Group is offered two times a year (Fall and Spring). During this six-week study the pastors and staff will have the privilege of getting to know you. Connection Group is required for membership. To help parents attend Connection Group we will reimburse for childcare based on our childcare reimbursement policy. Print out this Childcare Reimbursement Form and follow the instructions to receive a reimbursement. For more Information regarding Connection Group please contact Kevin Willsie @ 318-797-1203 or .